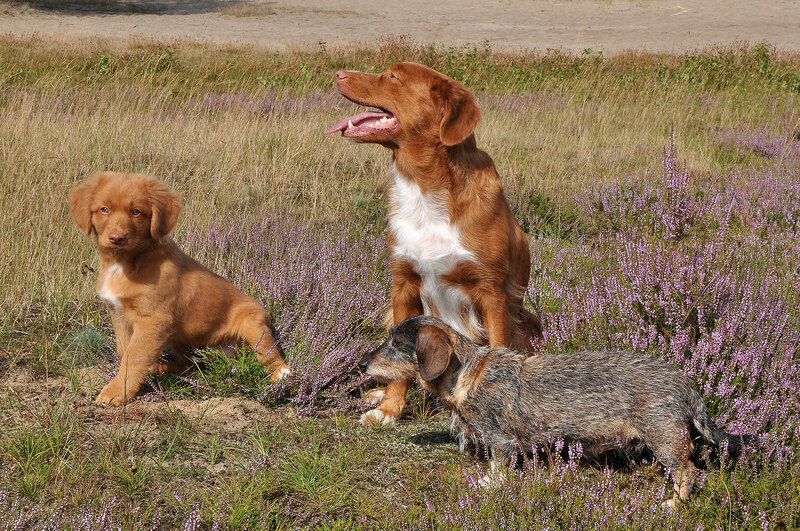 Sabine was surrounded by dogs since kids age, and there was hardly one day she did not share her life with her own dog. In the beginning this love of dogs was concentrated to dachshounds (German Teckel). Her first own dachshound Betti was followed by Fine and now our beloved Rieke. After we invested a lot of educational time with Rieke already (Tracking work, basic obedience, searching) the wish to own a dog to work with even more intense established. 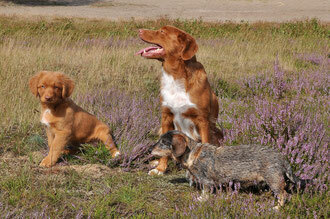 We chose to take a Toller, and since 2010 Brenia is enriching our life now. Somehow we got "ignited", and became fond of dummy work. Our first very exciting exercise was to participate in a training working test "Waterkant" near Egestorf in 2013, where we were able to demonstrate that we were on the right track with our work. We were able to confirm this result when participating at the working test for beginners at Ringstedt, where we had some very exciting and amazing impressions, and were extremely delighted of the very fair judges who confirmed us to be on the right track forward with our way of working. Especially when judge Petra Behringer after the first exercise (seeking) asked : ...and why have you not yet managed to pass Dummy A (novice) examination? In a retrosperpective we just can emphasize and recommed to everybody: Enjoy this novice time ...and use it to get aquainted with working test levels and build on the experiences you are gaining there. After passing the Dummy A (novice) exam in Hamwarde (judged by Ronald Pfaff) with 68 out of 80 points (coming in 4th) this time is now over, and in 2014 we participated in the first official working tests. You can find the results here. We also had success in exhibitions, and so the wish to start breeding began to arise. Breed allowance, Kennel registration, finding the perfect stud all took place, and as a result since 25.05.16 our little Micco is enlarging our pack.